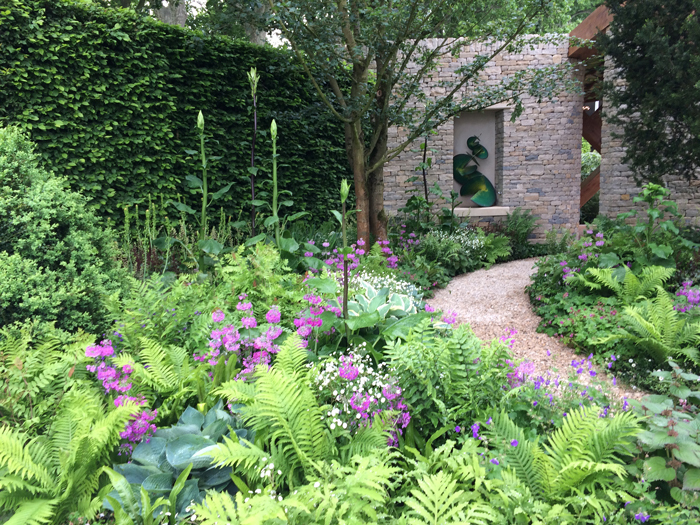 Chris Beardshaw talks to Reckless Gardener’s Sandy Felton about his garden for Morgan Stanley at the 2017 Chelsea Flower Show, the challenge of growing his own plants and the importance of colour. Designing and building a major RHS Chelsea Show Garden is enough to cause most of us grey hairs but to actually grow your own plants for the garden as well is dedication indeed. Chatting to Chris Beardshaw about his garden for Morgan Stanley is a horticultural treat like no other. 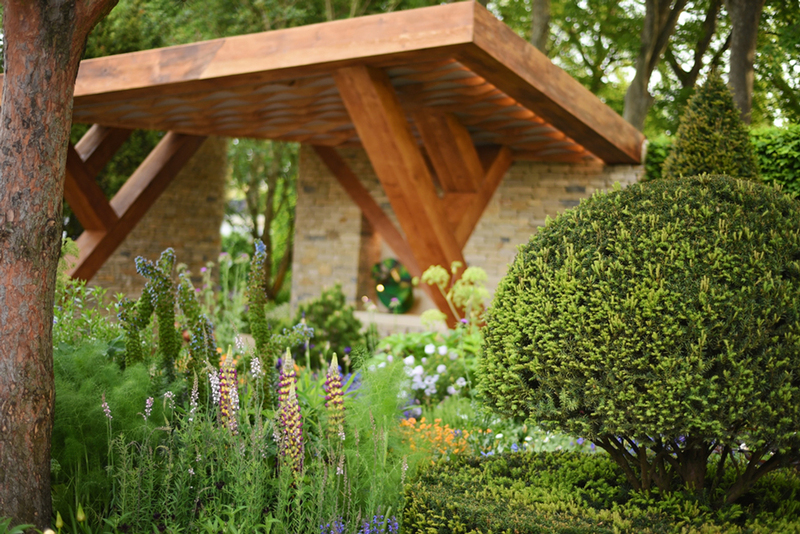 Here is a master of colour and planting style, a multi Gold Medal winning designer who continually delivers some of the most stunning gardens at RHS Chelsea. His enthusiasm is infectious and his love of plants and all things horticulture shines through his every word. 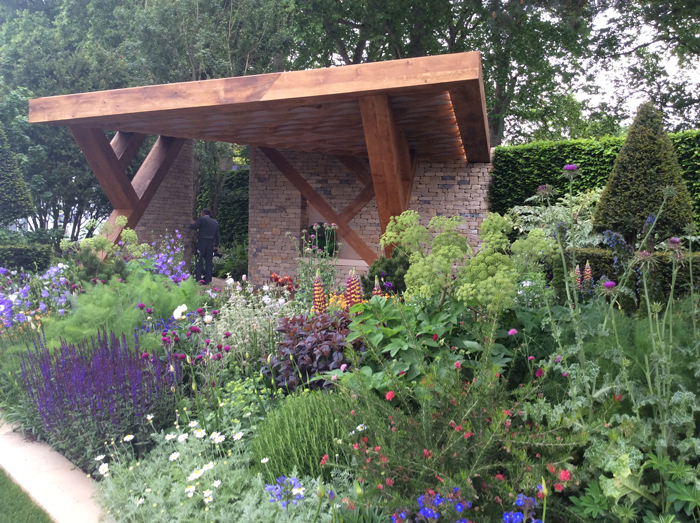 For the 2017 Morgan Stanley Garden (Silver-Gilt) Chris (pictured left)has designed a garden that can be viewed from three sides and it features two distinct planting areas. As Chris points out the hard landscaping forms a sinuous path leading from a naturalistic woodland – underplanted with an array of woodland perennials such as Hosta, Geranium and Ferns – to a dramatic, oak and limestone Loggia before winding its way to a third zone that contrasts with the woodland to form a sun soaked terrace at the front of the garden. Here we experience an abundance of rich planting including jewel like perennials such as Iris, Echiums, Agapanthus and herbs. Chris has also designed the beautiful Loggia using as his inspiration the study of fractal geometry, as found in nature and the structures of nature. 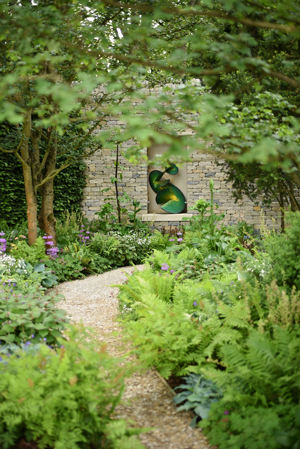 The theme of the garden celebrates the opposing environments that can be experienced in British gardens and the patterns found in nature, music, art and communities. Morgan Stanley and Chris worked with the National Youth Orchestra of Great Britain to perform a unique piece of music inspired by the garden’s design exploring how the emotional responses created by the garden can be expressed in music. The young musicians certainly brought a very special feel to the garden on press day. I asked Chris about his choice of the colour blue as I have always considered this one of his signature colours and one which he uses to great effect: “Blue is undoubtedly a very calming colour, when we think about the colour palette and how we use it in the garden, blue creates that feeling of space and calm and cool and its perhaps because of the relationship between the shadows and the colour of ice that we see blue and we are instantly calm,” he explained. That is one end of the spectrum but the other end is the oranges, yellows and reds which Chris explains are undoubtedly hot, vibrant and stimulating but they also advance so the red end of the spectrum comes right at you and assaults you whereas the blue end of the spectrum tends to be submissive and recedes into the garden. 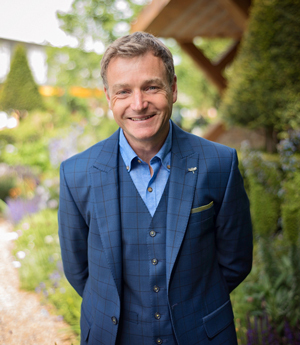 On the subject of growing his own plants for the show garden, it is perhaps no surprise to know that Chris started out growing plants when he was four years old! From the age of 11 he worked in a commercial nursery until he was 23. This year he has clearly relished the opportunity to get his hands dirty and getting to know the personality of his plants. “There is something fabulous about getting your hands in the ground in November, potting plants on, changing the feed regime and moving them around. You get to know them intimately and I think this gives you an advantage when you bring them on site because you know what their personalities are and you know what week they are in their flowering cycle and maturation.” Obviously this gives him the confidence to know that there should be no surprises: “If you go supermarket shopping and buy plants you never quite know what’s going to turn up but actually here, having grown them all on the roof of the Cotswolds 800 ft up in a cold but fabulously beautiful old nursery, I knew what was coming in and how to use them,” he explains. Spending more time with his plants and cultivating a relationship with them (forgive the pun) helps get a much better idea of what species works with what and the various relationships within the community of plants. Each night found him watering for two hours and there were occasions when he got up in the middle of the night (when the temperature went down to -2) to fleece the plants. I suspect the odd Fox also gave him a couple of nightmares but the intimacy that he built up with his plants, as any nurseryman will tell you, is priceless. Another challenge is the number of plants you need to grow for a show garden. This year his garden was huge and he knew he needed to grow about 3,000 plants. So he grew 3,200 leaving him with a margin of error of virtually nil. He actually got 2,850 plants into the garden – another testament to his skill as a horticulturist. Chris explains that when you grow plants yourself you see not only the colour that first grabs your attention, you also see the secondary and tertiary colours: “A great trick when you are making a garden is don’t look at the obvious colour, look at the secondary colour,” he says. To illustrate his point he directs our attention to the lupin next to him: “This is Persian Slipper,” he says. “Ask anyone what colour it is and they will say blue but look closely and you will see that it has a wonderful striped underside to each flower and then as the flower spike extends it reveals white and at the base of the flower spike its lime green.” The lesson here is that any one of those colours can be put together, you just have to pick them up. This simple fact has made me think about how I look at plants in the future. He clearly relished the challenge of getting back to his horticultural roots with this garden, confessing that for him, the planting is the aspect of any show garden creation he loves the most. It is clear from his enthusiasm that this year growing his own plants for The Morgan Stanley Garden has been especially rewarding. The garden is beautiful and I have a hunch that it is going to be a strong contender for People’s Choice. It is certainly mine.